In addition to a number of major product announcements, Apple also showed off its new Thunderbolt-based gigabit network and FireWire adapters Monday at the 2012 WWDC. In order to enable support for the adapters on older Macs, Apple rolled out a quick update through its automatic software updater service last night. However, a growing number of Mac users are reporting a critically serious "kernel panic" error with some Macbooks and iMacs. 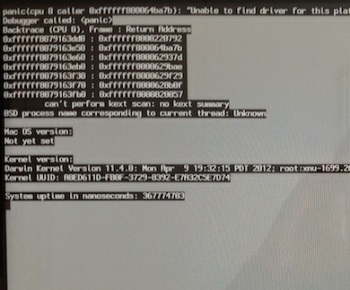 Kernel panics are the *nix equivalent to a Windows BSOD. It is not yet clear why kernel panics are popping up on some systems and not others, but two things all of the reports seem to have common are a Mac equipped with a Thunderbolt port and an installation of Lion (Mac OS X 10.7). Although Apple hasn't officially acknowledged the issue yet, all Mac users are urged to avoid the Thunderbolt update until a fix is issued. Once a Mac is hit with the bug, it is basically rendered unbootable until the problem is fixed or Mac OS is reinstalled. For temporary access, I suspect safe boot still works though -- hold the shift key during boot. If it's too late and you've already performed the dark ritual, there is one non-surgical solution that is both simple to do and users are verifying works: use Lion's recovery partition feature to repair Mac OS. Users can initiate the repair process by powering up (or restarting) their Mac and hold the Command + R keys simultaneously after the boot-time "chime" sound. When prompted to do so, choose to re-install Mac OS X and log on with your Apple ID. It'll take awhile, but the reinstallation process will solve the issue. If the word "reinstall" scares you, don't worry -- users who perform these steps won't lose their data. All of your personal files, application settings and most of your system configuration .plists should remain unscathed.